Writing is the last section of the IELTS test after Listening and Reading sections and lasts for 60 minutes (IELTS Speaking test is conducted on a separate date). 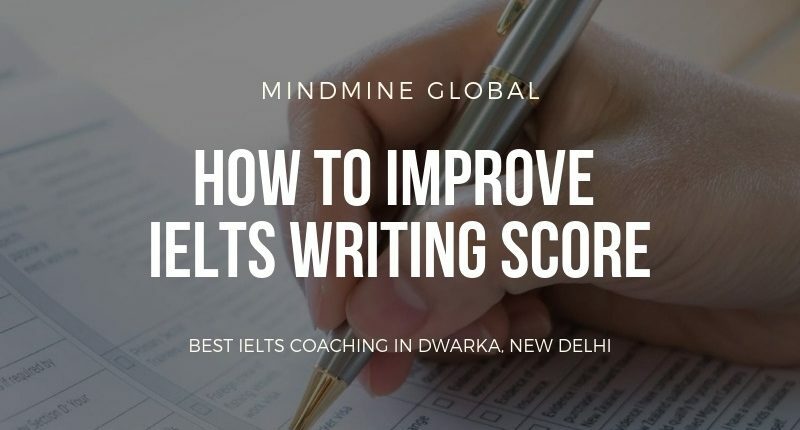 here is how to improve IELTS Writing Score from 6.5 to 7. IELTS writing task 1 is of 20 minutes with a minimum requirement of 150 words and IELTS writing task 2 is of 40 minutes and has a minimum requirement of 250 words. Many times the test takers find it challenging to get the desired IELTS band scores in the writing task. The IELTS General Training test-takers often ask – how to improve IELTS writing score from 6.5 to 7 or how to improve IELTS writing score from 6 to 7 bands? Well, there are many factors which can help you improve your IELTS writing score in the writing section. 1 Which test are you taking – IELTS Academic or IELTS General Training? The primary difference in the two tests is Task 1. While IELTS Academic writing task 1 is summary or description of a given chart, table, graph, process or a map; a letter has to be written in IELTS General Training writing task 1. It can be a formal, semi-formal or an informal letter. Candidates often come up with the question of how to improve writing skills for IELTS general, so the difference needs to be well understood before booking the test. Task Response or Achievement: This criterion checks whether the test taker has fully understood the requirements of the task and he provides an accurate, relevant and appropriate response to the task. There is a requirement of a minimum of 150 and 250 words for IELTS writing task 1 and task 2 respectively. You can improve your score by carefully understanding all the requirements of the task. It is critical to understand the statement in the IELTS essay question before you start writing. Coherence and Cohesion: There should be a logical flow of ideas which are well connected through linking or cohesive devices and referencing. There should be an adequate number of body paragraphs to provide a structure to the response. Lexical Resources: If you need a higher IELTS bands score, you should have a good range of vocabulary, and it should also be specific to the task. Care should be taken to paraphrase, and it is advisable to use uncommon words to improve your score under this criteria. Grammatical Range and Accuracy: While you are expected to have an accurate usage of grammar in terms of tenses, punctuations, word order, articles etc. ; sentence structures play an important role to achieve a higher band score in this criteria. You are required to use a good mix of simple and complex sentences to demonstrate your excellent writing skills. Even if you have a good command over the English language, you still need to improve the writing as per the IELTS standards. A regular writing practice is required to achieve the desired band score. It is a common query from the students – how to improve writing skills in English for IELTS. You need to keep the IELTS writing band descriptors as the benchmark to raise the standard of your writing. It is a good idea to take professional help from a certified IELTS trainer who can give you feedback as per the IELTS standard. You cannot give a good response to any writing task question if you do not plan the writing. You need to give 4-5 minutes to make notes about the main ideas and supporting ideas. Every good writer includes this in his writing practice. In fact, this should be a regular practice whenever you are required to do any writing task. You can also use this time to plan the opening thesis statement, body paragraphs, examples and a conclusion. In this way, you will fulfil all the assessment criteria and achieve a higher band score. Many test takers find it difficult to generate ideas under pressure as they are already tired and exhausted after doing the IELTS listening and IELTS reading. Although the IELTS examiners do not expect you to write a well-researched essay for the IELTS writing task 2 in a short time of 40 minutes, you should be able to provide a well-developed response to the question to achieve a higher score in task achievement criteria. This writing skill can be enhanced by reading from a variety of resources like newspapers, articles, journals or books. It is a good idea to check the recent IELTS writing questions and do the writing practice as per the topics. Candidates often research online to find ways as to how to improve writing skill in IELTS. There are many websites or videos of people who offer help online, but they might not be certified IELTS trainers from British Council or IDP. Also, they cannot provide constructive feedback on the writing practice that you would have done. Further, you may not be in a position to recognise your mistakes or your weakness without the help of a professional trainer. You can join a reputed IELTS coaching centre to get an accurate assessment of your writing tasks. It would cost you if you take such services, but it will be less than the cost and pain of taking another IELTS test.